"Ozer zen 'ead straight to ze westend of ze crypts," Ines said, partially joking but not completely. "Probably just 'ead to bed." Shiyumi picked at her food and sighed. She looked up at professor Elantrix. She opened her mouth, closed it, and then turned back to her plate of sprouts before pushing them away. She desperately wanted to leave but she didn't know the password. "Professor," she said, looking back at Elantrix. "Wourd you happen to know the Srytherin common rooms password?" "same here well good night" then jeremy goes to the ravenclaws boy crypes and goes to bed. Shiyumi stared after him leaving and stood up with a sigh. She figured it was up to her to do some guessing tonight. She trudged out of the hall and towards the Slytherin common rooms. Giera ate up, called together the houseghosts, and informed them each house's password, except, so that they could lead the students on. 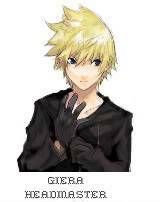 Giera Sighed, and walked out to his office.